Nitrogen use to grow vegetables along the Central Coast is the subject of proposed regulations by the Regional Water Quality Control Board (RWQCB). As a result there is increased interest in improving the efficiency of applied nitrogen (N) fertilizer. Understanding the uptake pattern of lettuce is critical to careful N management. Lettuce typically takes up 120-140 lbs of nitrogen in the above ground biomass with the higher uptake levels occurring on 80 inch beds with 5-6 seedlines. The uptake patterns of romaine and head lettuces are similar. Figure 1 shows the uptake of N in a lettuce crop over the growing season. At thinning (app. 31 days after planting) the crop had taken up less than 10 lbs N/A. 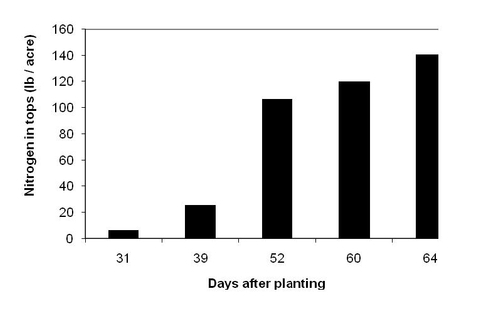 The biggest increase in nitrogen uptake by the crop occurred between 39 days and 52 days after planting. The most difficult task in managing nitrogen fertilization of lettuce is to supply adequate levels of nitrogen during this period of high demand by the crop, but to not leach it during irrigations. In second crop lettuce it is possible to take advantage of residual soil nitrate and use it in place of applied fertilizer. Figure 2 shows a typical pattern of nitrate-N levels in Salinas Valley soils. 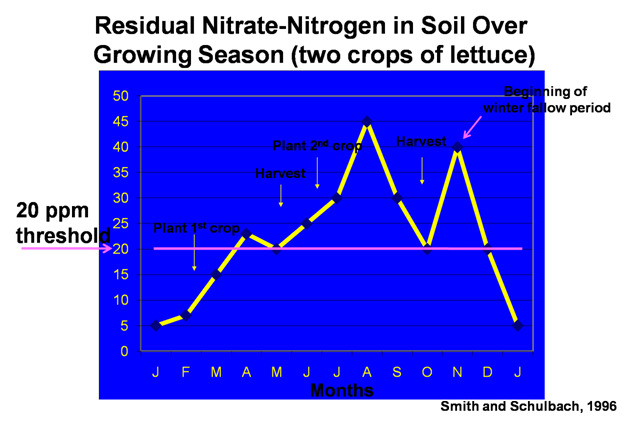 The data indicates that typically by the time you get to the second crop, levels of residual nitrate-N can increase above 20 ppm (which is equivalent to 80 lbs N/A) due to left over N applied to the prior crop and mineralization of nitrate-N from crop residue. Whatever the source of the residual nitrate-N, it is a substantial quantity that can be utilized by a growing lettuce crop. 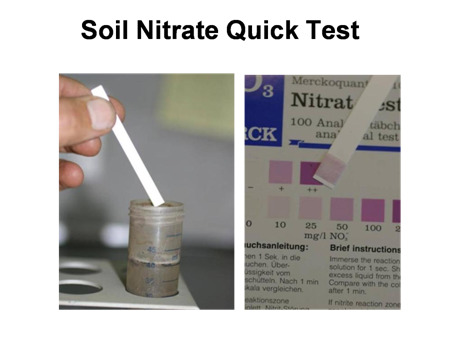 Residual soil nitrate can be monitored by use of the soil nitrate quick test (see photo 1). The test provides information on levels of soil nitrate-N and can help you to decide whether you need to apply fertilizer as planned or if you can reduce This test is most effective if done at thinning to determine residual soil nitrate levels for the first post thinning fertilization and can be done again prior to subsequent fertilizer applications if desired. Figure 1. Nitrogen uptake by lettuce over the growing season.